Outdoor Research put their award winning Crocodile Gaiters on a diet, and the Verglas Gaiters were the result. Designed to be lighter and easily packable, the Verglas Gaiters are built with durable Pertex Shield waterproofbreathable fabric while retaining the performance fit of the famous Crocs. Constructed of Pertex Shield 3L 100% nylon 70D ripstop. Cordura 500D inner leg and boot. Waterproof and breathable. Lightweight. Abrasion resistant Cordura boot. Molded boot section. Webbingcam buckle top closure. Reinforced boot lace hook. Hypalon instep strap. 1.5 inch wide hookloop front closure. Avg. weight: 7.3 oz. Import. Your browser isn't supported for displaying eBay items. 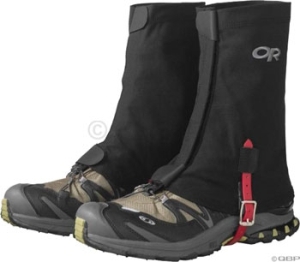 Go to eBay to search for Outdoor Research Verglas Gaiters.